We are living in a most incredible time where opportunity abounds and the winds of awakening are blowing. But like Charles Dickens said in the first lines of his classic A Tale of Two Cities, “It was the best of times and it was the worst of times.” The mercy of the Lord and the action of believers has made the enemy livid at what has happened in our past national election and he is going all out to demonically incite rage and lawlessness everywhere. The blatant, un-muzzled, and defiant voices coming from the liberal camp are accusatory and spewing lies and half-truths. But they are being countered by equally as damaging conservative voices that are politically motivated, bent on establishing their own form of dominance, and also telling half-truths. The opposition to our president is as unprecedented as his victory was last November. The battle for the heart and soul of our nation is fierce, but when we cry out for mercy, God hears us! Urged by the Holy Spirit to look up the number in Strong’s Concordance, he found 313 to be the Greek word for “new birth” or “new beginning.” He then was led to look up the date of the 313th day of the year. It was November 8, 2016, America’s election day! The interpretation was: in answer to the prayers of the Church, a great awakening and reformation (a “new birth”) will begin for America on November 8. What a powerful revelation, but it was only the start! When describing the elections, Dutch says, “I use the word ‘mercy’ very intentionally. For others and myself, three profound occurrences caused this word to become our primary appeal to heaven during that season.” First, in February 2016, Dutch was praying with two friends at the White House and they had an angelic visitation. In response to their prayers and decrees, the angel simply said, “Mercy, mercy, mercy, mercy, mercy, mercy.” Six times. Immediately, I texted the vision to a friend in Ohio that would be able to share it with Dutch and then I went to bed. I tossed and turned all night, waking to draw images of coins on the pad on my nightstand. I finally just got up and went downstairs to begin drawing again what I had seen in the vision. First thing in the morning I went to an artist friend and asked him to help me. A short time later we had created a piece of art with the three coins from the vision. Unknown to me Dutch was releasing the vision publicly at the exact same time we were creating the image. From there, “Mercy is our new currency!” became the rally cry for thousands as we raced for Election Day, which culminated in the powerful halt and turnaround of the disastrous agenda and course that we were following as a nation. Dutch wrote shortly after the election: “Mercy is undeserved kindness. In scripture it is linked to covenant—God’s covenantal faithfulness and kindness. We are told that His mercies are new each morning (Lamentations 3:22-23), and they also triumph over judgment (James 2:13). Merry Christmas, America, you just experienced incredible mercy!” It’s true; we received the triumph of mercy over judgment! The Presidential Inauguration was an Isaiah 22 moment as Shebna was removed and Eliakim was brought into power. The Christian Inaugural Gala of evangelical prayer leaders and supporters had the theme “Celebrating God’s Mercy.” A memo from heaven had been released instituting a new medium of exchange! It’s very important for us to comprehend what we have received and what that means, because we must now act with purpose and authority in order to navigate these convulsive times with strength. The question presented to us now becomes, “Will we waste this precious gift, or spend it wisely? There are too many times we have rallied and prayed to see righteous change, only to chalk up the win and forget about the ones we’ve prayed into position once they get there. We cannot have a repeat performance; in fact, I would prophesy that we WILL NOT have a repeat! The awakening is here, but it’s like newborn Bambi on spindly legs and miles from the strong, stately stag it will become. We must realize the moment we are in, continuing to cry out for mercy and keeping the furnace stoked. Scripture is clear that God’s word does not return void and that it accomplishes what He has purposed it to do. This is also true with His revelation as it has a purpose and a plan. After receiving the vision that night, there was Divine life in it and it continued to develop and grow. It became a mantra of direction and encouragement shared in print and on social media. It took on new form and became a piece of artwork that has an ongoing encouragement and challenge. But the word is still transforming and becoming! Shortly after the election a team of investors backed the minting of an actual “Mercy Coin”. These kingdom entrepreneurs saw the need for a commemorative coin that could be a focal point and a tangible reminder of the mercy we have received and the currency we are exchanging on heaven’s trading floor. The coin was born of real silver and gold, marking the changing of an economy and the establishment of Kingdom understanding where it will no longer be a “bear” market or a “bull” market, but a lion market ! In it’s second minting, the Mercy Coin is bringing hope to not just America, but to the nations of the world. Recently, I was with some businessmen from South Africa and they relayed how prior to the election they knew that Donald Trump was going to be our new president, because so many people were crying out for mercy. They said, “God heard and showed you that mercy was our new currency, but our cry is that He would not only do the same for our country, but make mercy coins an actual national medium of exchange!” Other countries have been watching as well and like the South Africans, they see God’s mercy being extended to us and they are asking for a turning where they live. From across the nation and around the world, I would encourage you to join Dutch Sheets, many others, and myself as we hold our Mercy Coins in our hands as a contact point to thank God for His mercy. But much more than that, it is a flashpoint for revival and awakening in America as we use our new currency to step onto the trading floor of heaven and see His NEW GLORY released! To get your coin, go to mercycoin.com and let’s get MERCY into circulation. 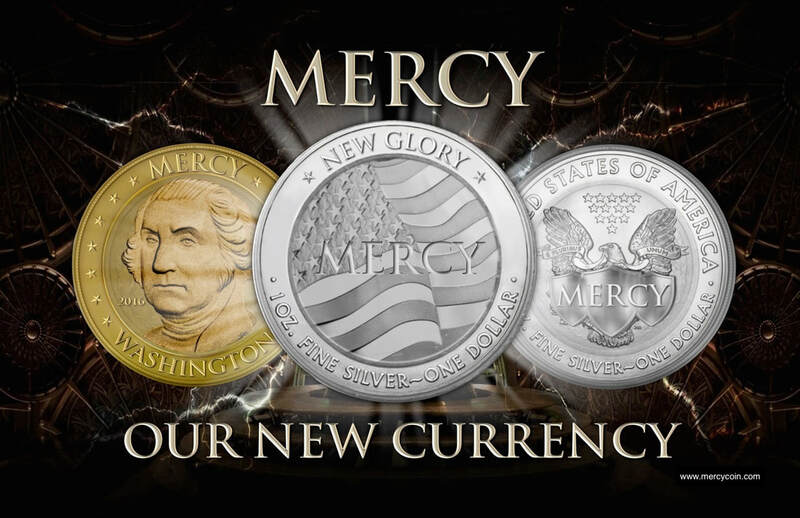 Mercy is our new currency! Let's remember the powerful victories in this past election and celebrate God's triumphant reserve changing history through worship and intercession!